Netanyahu is in his own way a bit of a showman and he obviously loves to put on a bit of a display. Just like a fairground barker. He did the same thing in Sept 2012 when he appeared before the U.N. General Assembly with cartoons to illustrate that Iran was on the “threshold” of building a nuclear bomb. That was six years ago and the Iranian nuclear capability has yet to be revealed. However, it is abundantly clear that Netanyahu has tendency to make wild predictions about Iran’s nuclear ambitions. 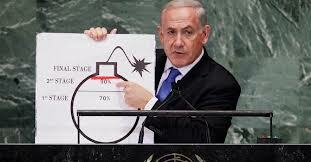 For example, in 1993 Netanyahu is on record as claiming that Iran would have a nuclear bomb by 1999. Of course, he did the same thing in 2012 when he claimed that Iran was only “six months” from developing its own nuclear weapons. Both announcements provide a useful background to Netanyahu’s latest claims. In plain language the man is prone to make wild, unsubstantiated claims that need to be taken with a dose of healthy scepticism. Ed. Israeli Prime Minister Benjamin Netanyahu on Thursday described what he said was a secret atomic warehouse in Tehran and accused Europe of appeasing Iran as he sought to rally support for U.S. sanctions against the Islamic Republic. 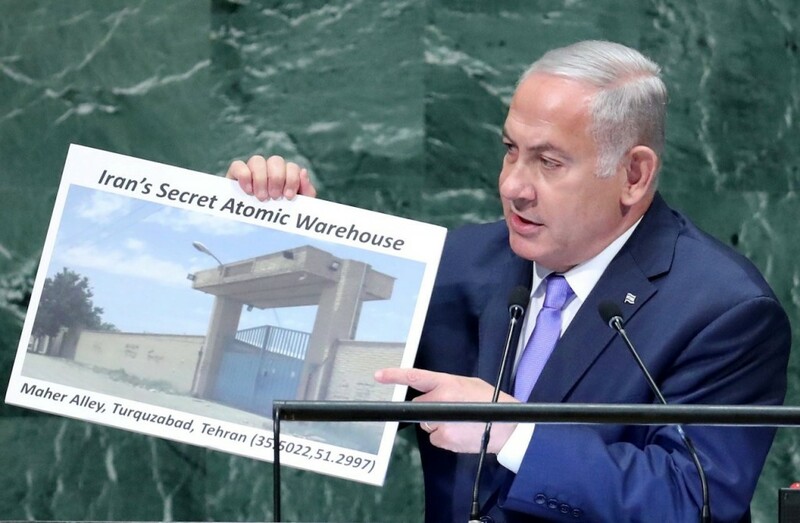 Addressing the United Nations General Assembly, Netanyahu showed an aerial photograph of the Iranian capital marked with a red arrow and pointed to what he said was a previously secret warehouse holding nuclear-related material. He argued this showed Iran still sought to obtain nuclear weapons, despite its 2015 agreement with world powers to curb its program in exchange for a loosening of sanctions. Netanyahu said the site contained some 15 kg (33 pounds) of radioactive material that has since been moved and called on the U.N. atomic agency to inspect the location immediately with Geiger counters. “I am disclosing for the first time that Iran has another secret facility in Tehran, a secret atomic warehouse for storing massive amounts of equipment and material from Iran’s secret nuclear program,” Netanyahu said. The world will laugh at Netanyahu’s claims, Iranian foreign ministry spokesman Bahram Qassemi said, according to Fars News. Iran’s Foreign Minister Mohammad Javad Zarif said that there should be more scrutiny on Israel’s nuclear program. “No arts & craft show will ever obfuscate that Israel is the only regime in our region with a *secret* and *undeclared* nuclear weapons program – including an *actual atomic arsenal*. Time for Israel to fess up and open its illegal nuclear weapons program to international inspectors,” Zarif tweeted. In April, Netanyahu presented what he said was evidence of a large secret archive of documents related to Iran’s clandestine nuclear weapons program at a different site in Tehran. “This site contained as much as 300 tonnes – 300 tonnes – of nuclear-related equipment and material,” he said. Under the nuclear deal struck by Iran and six major powers – Britain, China, France, Germany, Russia and the United States – Tehran agreed to limit its nuclear program in return for relief from U.S. and other economic sanctions. The International Atomic Agency (IAEA) has repeatedly said Tehran was abiding by its commitments to the deal, formally called the Joint Comprehensive Plan of Action (JCPOA), including in a document reviewed by Reuters on Aug. 30. “In Lebanon, Iran is directing Hezbollah to build secret sites to convert inaccurate projectiles into precision-guided missiles, missiles that can target deep inside Israel within an accuracy of 10 meters (yards),” he said.